If you don’t know the name Letitia Wright, you will soon. In the last year alone, Letitia gave a gripping performance in the latest season’s strongest Black Mirror episode (“The Black Museum”), was announced as part of the cast of Steven Spielberg’s upcoming Ready Player One, had a part in the Liam Neeson thriller The Commuter, and that’s not even including her role in Black Panther — which, in case you’ve forgotten, hits theaters on February 16th. We’re only into the second month of the year, and already this 24-year-old has solidified herself as one of 2018’s breakout stars. I had first seen Letitia in her episode of the fourth season of Black Mirror. Without spoiling anything, Letitia’s role includes a pretty shocking reveal and multiple accents, and it could’ve easily felt hacky if not for her expertly crafted portrayal. It’s the kind of performance that makes you drop everything and say, “Who is that?” The latest installment in the Marvel Cinematic Universe confirms that this type of performance is not a one-off for Letitia. 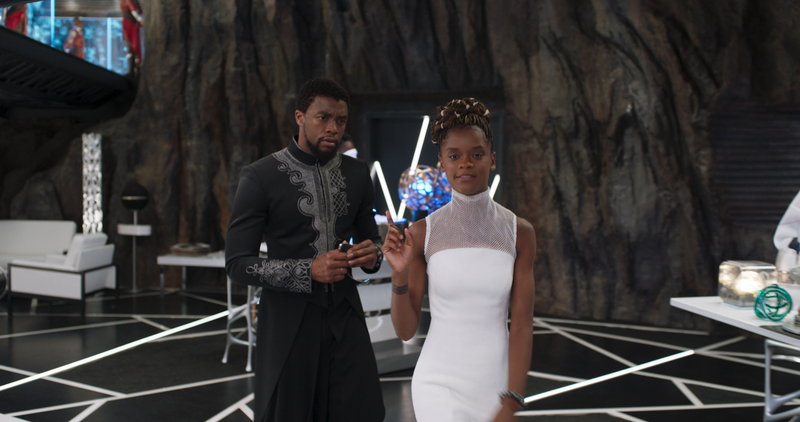 Letitia’s character Shuri in Black Panther is T’Challa’s younger sister and a bonafide tech genius. 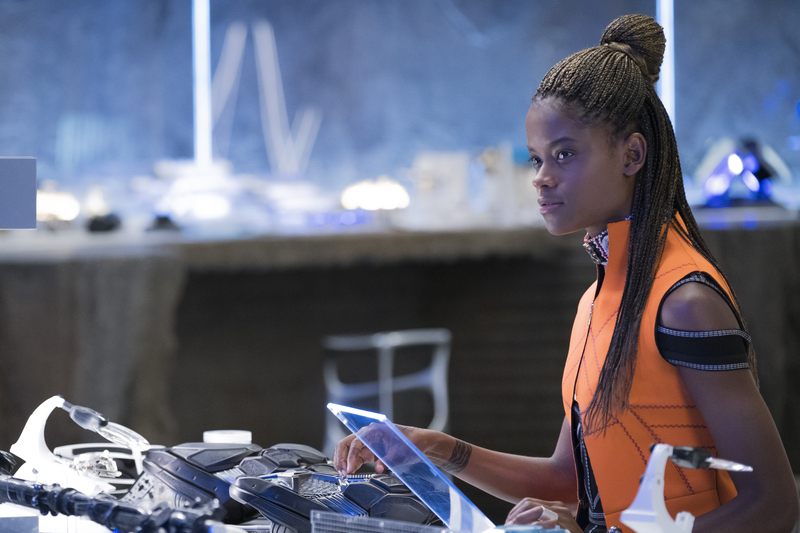 She’s created all of Wakanda’s most complex gadgets and technological advancements, and plays a pivotal role in many of the film’s action scenes. There are a handful of reasons regarding why Black Panther is groundbreaking: the film’s stacked Black cast, its complex political message, and Ryan Coogler, who is Marvel’s first Black director. However, it wasn’t until I got a Shuri doll at Disney’s Black Panther press event and thought about giving it to my little cousin — who is already a young Black genius in her own right — that the movie’s potential to impact really hit me. And I got emotional (really, I cried in the bathroom). There’s a lovely symmetry to the fact that Letitia, who was initially inspired to act after seeing Akeelah and the Bee, will now inspire a whole new generation of young women with her own role as a young Black prodigy. I got to speak with Letitia while she was doing press for Black Panther in Los Angeles — where she was, fittingly, wearing a sweater with Angela Davis’ face on it. 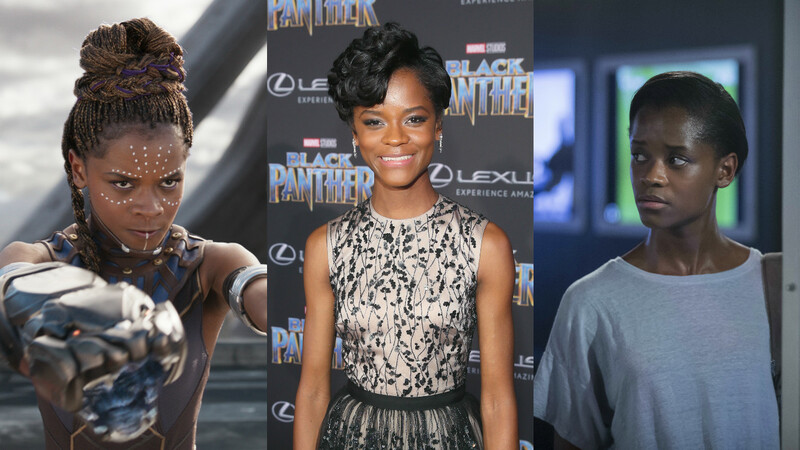 We talked about the film’s three-dimensional female characters, actors she admires, Wakandan fashion, and more. HelloGiggles: What was it like to watch the completed film at the premiere, with everybody in that moment? Letitia Wright: It was amazing. Months of hard work. Just being able to see it on the screen was really, really amazing and just a joy to have everybody’s reactions and how they took it in. I’m just really, really happy about it. HG: One thing I loved about the movie was how much the women seemed to drive the action and how developed the characters were. What was it like working with such an amazing group of actresses? Did they have any advice for you? LW: Yeah, it was really good to work with all of them. Everybody brought individual things to each character and everybody really just got along really well on set as well so that was good. In terms of advice, just listening a lot to Angela [Bassett, who plays Ramonda, T’Challa’s mother] just speak about her experience in the industry. Just giving me advice about staying grounded and doing it for the right reasons. HG: I read that you were inspired to become an actor because you saw Akeelah and the Bee. I think that now people will see your character, Shuri, and be inspired themselves. Do you have any advice for young women, especially young women of color who are trying to break into the entertainment industry? LW: Just to do it for the right reasons, I guess. Just to do it for that very purpose of doing work that’s going to mean something and not to do it to be a celebrity. That [kind of work] doesn’t look really fun, [and] I’ve been around enough to see that’s not really where it’s at. I guess what made me want to do it, [since I was] inspired by Keke Palmer in Akeelah and the Bee and…I [playing Shuri] could be able to have that same impact that Akeelah and the Bee had on me is really, really amazing and such a blessing. For the women that want to do this, I guess just to go into it for the right reasons and do work that’s going to really speak to people. I think if you have the right intentions, then things can come together. It’s not easy, but just to stay committed if you really know that’s what you’re meant to do, if that’s really your path. Don’t go on a path that’s not yours. I would say that. If you’re not meant to be an actor, then you’re not meant to be an actor, but if it’s meant to be for you, you’ll be fine as long as you do it for the right reasons. Work really hard, and really commit to the craft and really study films and theater and TV. Really commit to learning about playing a character. That’s really important. It’s not as easy as it looks. They always think all you have to do is learn lines and show up. It’s not that. It’s not easy. HG: I was at the Black Panther press conferences and one thing I found really poignant was Ryan Coogler talking about how women were involved in every stage of production on the film. There were women in costume, editing, production design. I was just wondering, did you feel that on set, and did that influence your experience at all? LW: Yeah, it did. It was really good to see that. I remember he did say that it wasn’t just because they were women, it was because they were very talented. I just love the fact that there are talented women out there who are doing amazing things in the entertainment industry and for the film world and the TV world, who are not just there in a position because they’re just women. It’s because they’re really talented. It was great to see that and it really just brought a lot of joy. HG: I also saw you in Black Mirror and I really loved your episode. HG: Black Panther and your episode of Black Mirror are both very explicitly political and I really enjoyed that about them. When thinking about your career, are you intentionally trying to be in more political art? LW: Not intentionally. I guess I’m just trying to be where the good writing is and if that means it’s that, it’s that. If that means that in that point in time I have to be a vessel for that character and that’s the subject matter of the story, then I’m going to do that. This is just the time for that, you know. There might be another project where I’m not in something political. It might just be something a bit lighter. It might be a Juno or something like that. Or it might be completely different but wherever I am in my life and my career, I just always go to the right projects that I feel is right for me to play. If I’m meant to be a vessel for that character, then I’ll play it. Whatever people take from it and get from it, then that’s good. It belongs to you now. Black Mirror belongs to you now. It belonged to me for a couple of months and my character was mine and I could be in her mind and her head. When it’s filmed and finished and packaged and released, it’s not mine. Black Panther, in about two or three months from now it’s not mine anymore. It’s the worlds. HG: Are there any working actors whose career you want to emulate? Letitia: I really like Saoirse Ronan’s work. I’ve always liked her work. She plays a lot of amazing lead characters. That’s the type of work I would love to do. She has a great mixture of commercial stuff that’s still good, still quality. Oscar-nominated stuff like Atonement. Sci-Fi world. Lovely Bones. And then art house, Lady Bird type stuff. So she picks really good projects and I really am inspired by her. I like her work a lot. The other person I would say is Naomie Harris. I really like her work a lot as well. HG: I really loved the costumes in the film, especially your character’s costumes. Did you have a favorite outfit to wear? HG: Did you know in the fitting? LW: Yeah, I was like, this is the one for this particular day. Then he was like, “If you love it, you can wear it. Do you love it?” I was like, “We’re not changing it. This is the one.” Ruth [Carter, the film’s costume designer] did an amazing job with everybody. She was great. Every single costume I got, it was just wonderful. Even the one I don’t really like wearing, for the big [ceremony] scene in the beginning, where we would have to get together to see my brother. Even that, I loved that because it was so cool, how it was made and some of the influences from places like South Sudan. It was just amazing. HG: Was there one moment from set that was outstanding, that you’ll always remember? I’m sure there were many. LW: Yeah, there were so many. I would just remember, it wasn’t filming anything, we were in my lab, myself and Lupita [Nyong’o], during a day where we had the big fight scene going on and we would break in between the take. We had an idea because Ryan has a particular way of talking. He’s from Oakland so he uses a lot of phrases that are very catchy. We would say [them] on set and we decided to collectively come together and find all of the things that he says and make a T-shirt and call it “Cooglerisms.” We would put it into the shape of the African continent and fill the continent, the gap, with all the words that he would say like “aight,” “bet,” “fo’ sho.” All the stuff that he would say we put in there. We put a picture of his face, just like my Angela Davis one right now. We put a picture of his face on the T-shirt and put Black Panther stuff [on it]. We made a lot of T-shirts to give out to everybody. We were filming one day and Lupita had the day off so she got the big boxes of T-shirts. He was there, his wife was there and his brother was there and we just presented it to him. He cried, but he was being super gangster about it and not showing anybody his thug tears. That was one of the coolest days. I don’t think he really expected it.